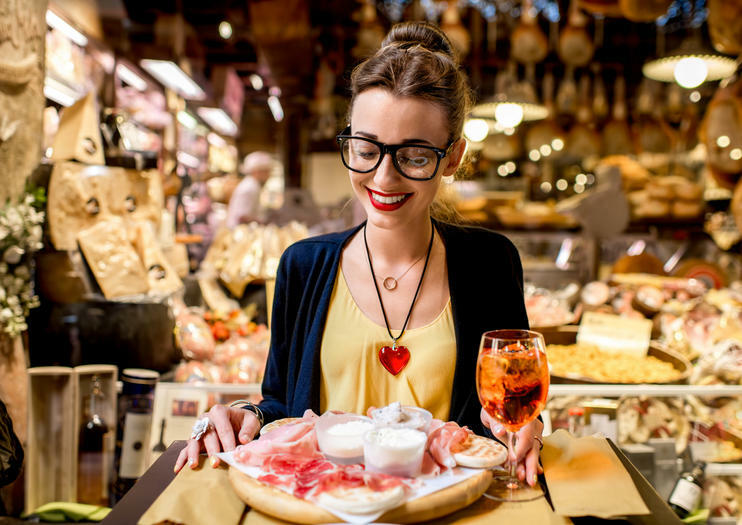 The concept of aperitivo has become more common in Italy’s big cities in recent years, but not everyone really understands what it means to have a pre- or post-meal aperitif. Read on to discover how to experience this dining tradition in Milan. Strictly speaking, the term aperitivo refers to any alcoholic beverage consumed before eating a meal and meant to trigger one's appetite. In practice, however, it typically means the pre-dinner ritual of a bar or restaurant serving an assortment of food that patrons get for free with the purchase of a drink. It may sound like any old happy hour, but that's not quite the same thing. In Italy, drinks aren’t cheaper during aperitivo—in fact, they can be a little more expensive than normal—and the buffet is free. While it's easy (and totally acceptable) for diners to make a meal of happy hour in some countries, you're not supposed to stuff yourself at aperitivo in Italy. It’s meant to serve as a light snack and drink before dinner, and one of the best places in which to experience the tradition is Milan, a city that prides itself on its cocktail culture. Be on the lookout for bars and restaurants setting up for the evening (with lots of sidewalk tables in nicer weather) in popular neighborhoods such as Nagigli just south of the city center and the classy Brera district near the Duomo. Browse on your own or book an aperitivo tour to make sure you're getting the best possible experience. Head out on an evening walking tour to scope out the possibilities and get recommendations from your guide, or choose a tour that specifically includes an aperitivo stop. It's even possible to relax over an aperitivo in the villa vineyard that was once owned and cultivated by Leonardo da Vinci himself. Explore the sights of the Lombardy capital with this 2-hour walking tour of Milan's city center by night. Enjoy an aperitivo like the locals do before seeing illuminated monuments of the city.